Complete Form: You have to fill out the online application . The system will ask you to pay the $15.00 application fee via PayPal system. Joint application: If you would like to apply with a friend, please send your application together with a note of explanation, including whether or not you would accept separate places. Although we will do our best to find places together, we cannot guarantee it. Form Review: A volunteer coordinator will review your application form and will inform you by email when you are accepted for next admission session or you have not been selected as a candidate to complete the interview process with our organization .This will usually be within a week but in some case take longer. Interview Session: The interview is mainly about your past volunteer experiences, English proficiency, and teaching plan. Note:The interview is mainly about your past volunteer experience, English proficiency, and teaching plan. You can make some preparation about your plans to teach small kids, which might be helpful before long. Our acceptance rate is fairly high, with about 60-75% of applicants being offered admission into our program. We have a formal application and interview process. However, we do believe in the value of self-improvement, and offer qualified candidates the chance to re-interview with our program, if they did not pass the interview in the first stage. We do require high proficiency in spoken English, as the development and promotion of English education and literacy remain our primary goals. On a scale of 1 to 5 (1 being not proficient, and 5 being native speaker proficiency), we generally recruit candidates who are a 4 or a 5 in terms of their verbal English abilities. These applicants are fluent in English, have natural pacing and speech patterns, have clear pronunciation, and are capable of using complex vocabulary and sentence structures. All of our applicants will teach and lead their classes in English. This does pose a bit of a challenge with the students speaking Thai (and very basic English). One of the things that we assess in our interview is how well you can communicate your lessons given the language barrier, and we look for ideas involving non-verbal communication and other patterns of effective communication skills. 5. Letter of Acceptance: If you passed the interview. You will be received a Letter of Acceptance by email. 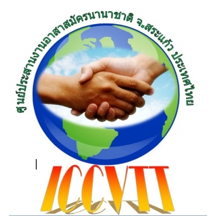 It is merely a mean to inform the volunteer that you is join our volunteer program team as guest for a specific period of time (As state on the Volunteer Contract) in the ICCVTT program. This letter is in no way designed to be used to acquire visa of fulfill any other immigration requirement by enter the Thailand government or any other. 6. Submit the Volunteer Contract and Placement fee.